One of the most persistent legends about America has it that Robert C. Hartnett, S.J., America’s editor in chief from 1948 to 1955, was ordered by his provincial superiors in May 1954 to stop criticizing the fiercely anti-Communist Senator Joseph McCarthy and that, a year later, they removed him as editor for what he had written. That legend of his removal is false; but the truth behind Hartnett’s ongoing battle with McCarthy is that in an era when attacking McCarthy was professional suicide, Hartnett did so repeatedly. Many of his fellow Catholics, including many Jesuits, did not approve. Yet Hartnett’s holy boldness had another side that would prove his undoing. As editor in chief, though, Hartnett was an autocrat of Shakespearean dimension. In theory he saw the other editors as advisors, but in practice he had a tendency to treat them as debate opponents, giving no quarter to their ideas and demanding that his own interpretation be applied to most everything they wrote. Little seemed to satisfy him; according to the magazine’s board of Jesuit overseers, he would make “tactless comments like ‘No one on the staff can write’” and often rewrote editors’ copy. He also sent many written complaints about various staff issues to John J. McMahon, S.J., the superior of the Jesuits of the New York Province and a member of America’s supervisory board. These letters were usually five or six single-spaced, typed pages, with important phrases or whole passages underlined or capitalized. Using language more appropriate for a prosecutor, he said employees had “given testimony” to him, and that he was providing “evidence.” And once he focused on a “problem,” he had trouble letting it go. The magazine’s board regularly praised Hartnett for his talent and work ethic, but showed concern over his treatment of the editors. In 1952 McMahon noted “the Editor’s failure to discuss questions calmly, to listen to advice, to recognize value in the ideas of others.” A year prior McMahon had written, with no little wit, “The Editor has made it clear to the Fathers Provincial how much he esteems the men under him; how loyally they cooperate and how indefatigably they work…. Perhaps he could take occasion to say the same thing to the men themselves.” The (irony and the point) were lost on Hartnett. But in February 1950, McCarthy’s accusation tapped into festering American anxiety. During the previous year the Soviet Union successfully tested an atomic bomb earlier than had been thought possible, and the Communist leader Mao Zedong evicted the Kuomintang from mainland China. The year 1950 would uncover acts of domestic espionage, including those of Alger Hiss, a high-level State Department agent, and Julius and Ethel Rosenberg. The Communists were coming; many feared they were already among us. American Catholics had a special investment in this conflict. Church encyclicals had long condemned specific propositions of Communism; even so, the political status of American Catholics remained in some quarters an open question. Blanshard’s screed against American Catholicism was a bestseller in 1949 and 1950, as well as a Book of the Month Club selection. When the Yale Law School sponsored a public debate between Blanshard and Hartnett in early 1950, the question posed was: “Is the Catholic Church fundamentally hostile to American democracy?” For a group still being asked to prove its trustworthiness, anti-Communism was a means of signaling loyalty. For many Catholics, McCarthy’s relentless pursuit of traitors over the next four years expressed the passion of their commitment to the United States. Then, in October 1953, McCarthy began an investigation into possible Communist infiltration of the Army, including the secretary of the Army. This new move provoked consternation even within his own party; to take on the secretary was implicitly to attack fellow-Republican President Dwight D. Eisenhower. The next spring Hartnett wrote an editorial opining that McCarthy’s actions encroached upon the jurisdiction of the executive branch, and calling on President Eisenhower to protect the balance of powers. Two weeks later a second editorial by Hartnett argued that anyone who asserts that his or her approach is the only approach regarding Communism has lost perspective—dangerously so. It took the letter columns of two successive issues to present the responses to these editorials. Reactions ranged widely from “I am proud of America” to “It is my conviction that your charge to the effect that Sen. McCarthy is splitting the Republican party, etc., is a lot of first-rate potash.” Hartnett himself proved unable to hold back from the fray, attacking critics for considering theirs the only orthodox point of view. “The McCarthy issue is one of conflicting opinions,” he admonished. A month later Hartnett returned to the issue again. In substance his editorial reworked old material, suggesting that the McCarthy hearings challenged the balance of powers. But he took the further step of suggesting that McCarthy’s actions amounted to a “peaceful overthrow” of the presidency. Hartnett published this editorial without showing it to any other editor. Even among Jesuits there was backlash. The Brooklyn Tablet and other publications were host to numerous, strong criticisms of America by Jesuits who wanted it made clear that the magazine did not speak for the Society of Jesus. In some Jesuit communities in New York City the divisions were so strong that the topic of the McCarthy editorials simply could not be broached. On May 29, 1954, McMahon informed Hartnett that America was not to write about McCarthy for two months: “America has stated clearly its position. We think it is best for America to let the matter rest there, at least for the present.” He also reassured Hartnett of the board’s backing. “We do not wish you to interpret this Directive as a vote of no confidence. It is not that. You are not asked to retract or change your position. You still have our support.” McMahon even left open the possibility of America writing about McCarthy in the future, subject to the board’s approval. John Baptist Janssens, S.J., the superior general of the Jesuits, however, was also troubled, particularly over the public dissension among Jesuits. In a series of letters to the provincials he noted that the magazine’s founding document directed editors to avoid questions of dispute among Catholics, “provided there is no question of danger to the integrity of the faith,” and spoke with concern about the spirit behind some of Hartnett’s work. It was not the first time the general had broached such concerns with the magazine. In August 1951 he had written to Hartnett directly, after the magazine had published the results of a survey about the opinions of Catholic teachers in Chicago toward African-Americans. The article revealed deep prejudices, but also stirred no little resentment. McCarthy’s world was in disarray by late 1954. Televised hearings over whether McCarthy had interfered with the operations of the Army had destroyed his credibility. “Joe Must Go” became the new slogan; and in December, the Senate officially condemned his actions. He remained in the Senate a broken man until his death in 1957 from alcoholism. In the summer and fall of 1954, America followed issues that had arisen from the controversy, particularly the importance of freedom of opinion, but Hartnett was publicly silent about McCarthy. A year later he announced his retirement. His explanation: exhaustion. “The fact of the matter is that I really have not had the stamina you showed and ran out of gas about a year ago,” he wrote to former editor in chief Wilfrid Parsons, S.J. But Hartnett suddenly and inexplicably returned to his old ways, “rewriting all that they submit; asserting that only Fr. Masse and himself can write, discussing with individuals the shortcomings of other members of the Staff,” being inaccessible and so on, according to a later memo from Henneberry to Janssens. Three of the editors wrote letters of complaint; so did Hartnett, who said, in Henneberry’s words, “the Staff that in February was very good now cannot write.” Frustrated with what he perceived to be a disproportionate burden being placed on him, and fearing total collapse, Hartnett soon asked to step down. He would go on to be dean of arts and sciences at Loyola University Chicago and later a professor of political science there. In his February letter, Henneberry noted that while Hartnett steered the magazine clear of further controversy post-McCarthy, “he lives in an atmosphere of puzzlement.” The issues surrounding what had happened haunted him, and he still talked about them privately. His dogged unwillingness to compromise or be satisfied had given Hartnett the courage to take a bold stand against McCarthy; but it had also kept him from trusting his peers. He left America dazed and exhausted, admired but in many ways alone. Fr. Hartnett was my professor and friend at Loyola in the mid sixties. I cannot thank you enough for recognizing him -- and his true love for America, the country as well as the magazine. Fr. Hartnett was the most brilliant professor I ever had, the hardest working, and a man of the most impressive character. He is still my hero. There's plenty to criticize about Joseph McCarthy without repeating stale or debunked charges to set up the McCarthy- Fr.Hartnett conflict. McCarthy in serving in WWII may not have flown 32 missions (not the first or last pol to exaggerate his record) but he flew at least a dozen where he doubled as photographer/tailgunner hence "Tailgunner Joe." His primary assignment was intelligence officer in the South Pacific. That McCarthy faced all kinds of charges is true. How many of these charges were true is another matter. Tax evasion? The IRS in 1955 gave him a $1,056 refund because he overpaid his taxes. Thomas Reeves deflated the Pepsi Cola charge a long time ago. The 205 number with respect to McCarthy's Wheeling speech is often repeated but is at least a disputed point. It is likely he said 57 (See Denver Post story of Feb.11,1950). The key point, however, in the essay is that Fr.Hartnett was a convinced Democrat espousing "many of the ideals of the Democrat party." McCarthy, a Republican, overreached (mild by today's standards; think about all the demonizing, false charges against Bush)against the Democratic candidate and was called on it by Fr. Hartnett, as a matter of truth. Fair enough. But the backlash against Fr. Hartnett should be given some context: fresh in people's minds were Democrat former Vice-President Henry A. Wallace who publicly apologized for being too trusting of Joseph Stalin;Alger Hiss'treachery;Truman reining in MacArthur who was destroying the North Korean/Chinese communist military offensive;the Rosenberg treason to name a few items,most, if not all of these,had Democrat fingerprints. Moreover,more and more was coming to light how FDR and the New Deal had been compromised by communists directly (infiltration) and indirectly(so-called progressives/fellow travelers). Subsequent events were to show that McCarthy was right about a lot of infiltration, treachery and lax security largely at the hands of Democrats not to mention countless Catholics whose relatives were now being persecuted and subjugated by communists in Eastern Europe handed over to the Soviets as part of post-WW II settlement orchestrated by FDR. This context would lead to the reality that after 1972 any Democratic anti-communists had largely become extinct. The backlash focused on the fact that McCarthy was blowing the whistle and going after all these characters a lot of times rightly sometimes wrongly. He was a hero in their eyes and Fr. Hartnett should stay out of his way. Their mistake was in failing to remember that evil must always be defeated by the truth. Fr. Hartnett was correct about that. Thank you for your historical article. Sen. McCarthy is part of the history of St. Mary Parish, Appleton, Wisconsin, where I am a member. We are currently celebrating our 150th anniversary as a parish. Your article provides some great historical context. 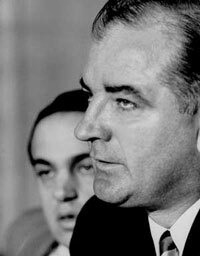 Without reviewing the entire public record, I believe that it is beyond dispute that Senator McCarthy was a shameless opportunist who callously ruined the lives of many innocent people in pursuing his own ambitions. We should be thankful for individuals like Fr. Hartnett who place zeal for truth ahead of their own safety. We could have used a few more of these during the years of Reagan's sleepwalking and George W. Bush's dismantling of constitutional structures. This article also appeared in print, under the headline "Cold Warrior," in the February 9, 2009 issue.